There are few mornings where I’m lucky enough to see 4:00 AM flashing on my alarm clock and it’s normally to catch a flight. This time it was to bike to a big pile of rocks. 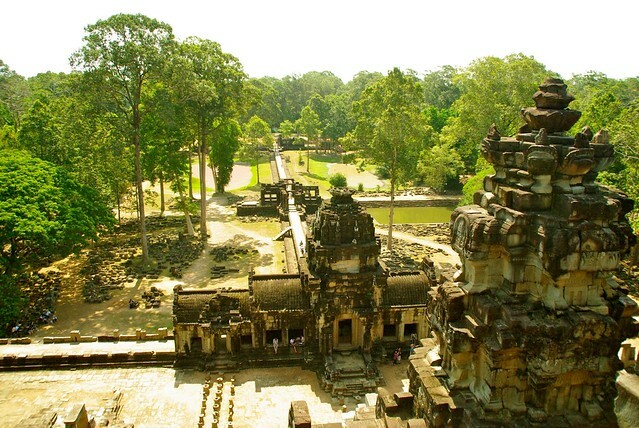 Angkor Wat is typically done by signing up for a tour, or paying a tuk tuk driver for the day to drive you around. Bicycling is becoming a more popular way to view these ancient ruins, and as always we opted for the DIY tour. We went to the ticket office the evening before to pick up our ticket. A one day pass is good starting at 5:30 PM the prior evening, so I suggest you show up the day before and watch the sun set over Phnom Bakheng. We got there early (around 4:15) to beat the bus tour queue which can make the wait rather long. Once you have your ticket you are clear to pedal through the park. 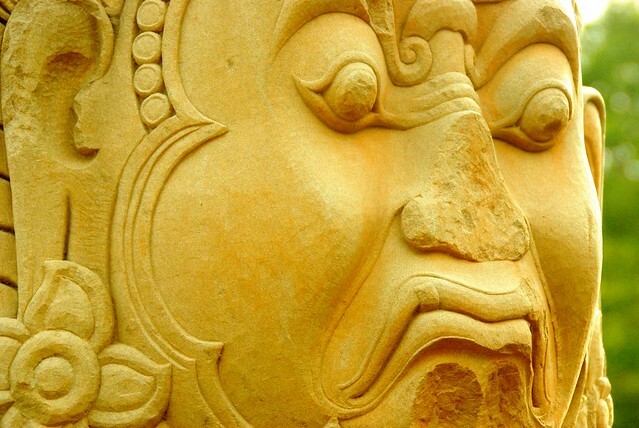 You can purchase 1 day, 3 day, week or month long passes to the Angkor Wat Park. Unless you are a serious photographer I dont think you need more than the 1 or 3 day pass. We were able to see everything we wanted to see in 1 day. It was a long, exhausting day, but we saw what we wanted to see. 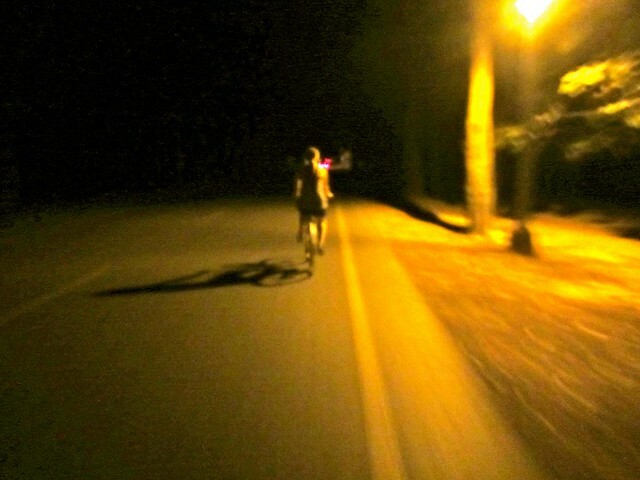 The next morning, we set our alarm for 4 AM, a bit earlier than those who hired drivers or tours to take them around and set off on our bikes. Sunrise was at 5:45, and we wanted a good spot for photos. We parked and locked our bike in the lot across from the temple and joined the already large crowd. Every seat is taken, every landing is being stood upon and every camera is focused waiting for the sun to rise at its own pace. We made our way slowly forward, eventually ending at the reflecting pool and got some really great photos! After you’ve gotten all your photos, there are a few stands nearby with noodle soup and coffee for breakfast. It is a long day, so sit down and eat! 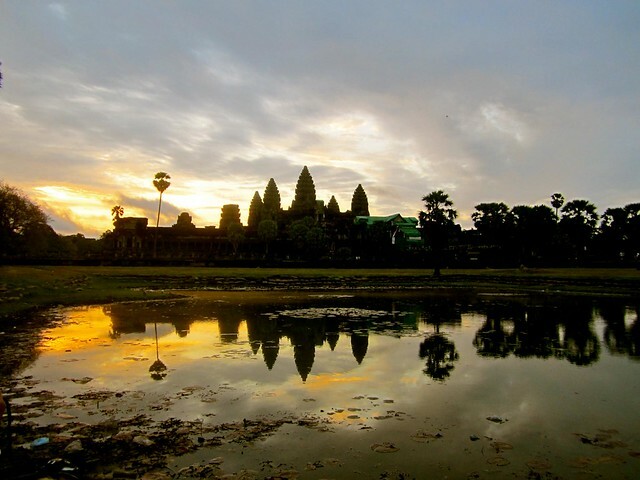 Don’t expect the sunrise at Angkor Wat to be a peaceful or spiritual experience. There are crowds of people everywhere, restaurants asking you to come eat breakfast and the token group of guys being utterly obnoxious at 5 AM. Everyone is fighting for the perfect reflection shot, so be patient. Our path was: Angkor Wat > Bayon > Baphuon > Phimeanakas > Terrace of the Elephants > Ta Keo > Ta Prohm (our favorite!) 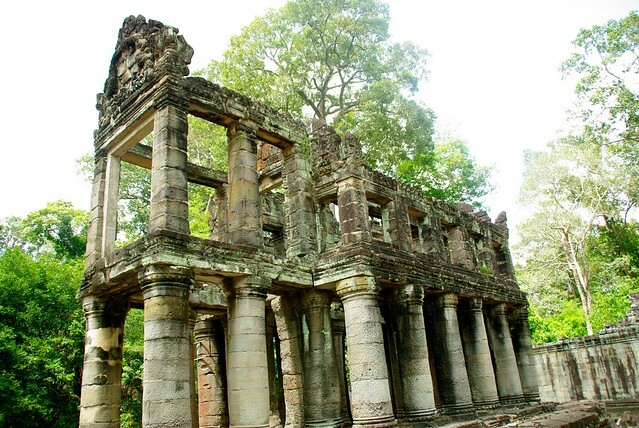 > Preah Khan. Although we didn’t have a guide to explain the writings on the walls and the ancient history surrounding the temples we were seeing, we enjoy asking a lot of questions while we are there to later answer with some research online. We enjoyed being able to move at our own pace and didn’t feel rushed at any of the sights or stuck to look at anything we didn’t like. While some of the temples were jaw dropping, not all of them inspired us. A quick walk around was enough for some, but I could have marveled all day at Ta Prohm and Preah Khan. After sunrise until around noon the temples are filled with tour groups. 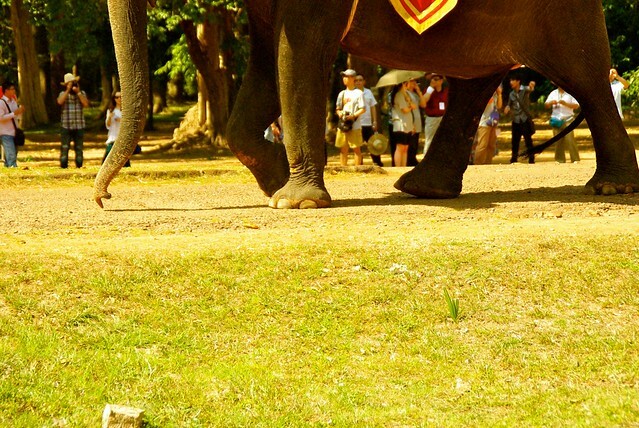 You will be walking though the temples with 3 – 4 buses of 50 passengers each. It can quickly get annoying and ruin your experience. It is difficult to take a picture without getting anyone else in it. We took a long lunch break and after going back out after lunch the roads and temples were near empty. We were amazed at how peaceful the once chaotic sights were. If you can bear the mid-day heat we would suggest going home and taking a power nap after sunrise and returning on your bikes in the early afternoon. You may have some temples all to yourself! Bring more water and snacks than you think you will need. It can get very hot. 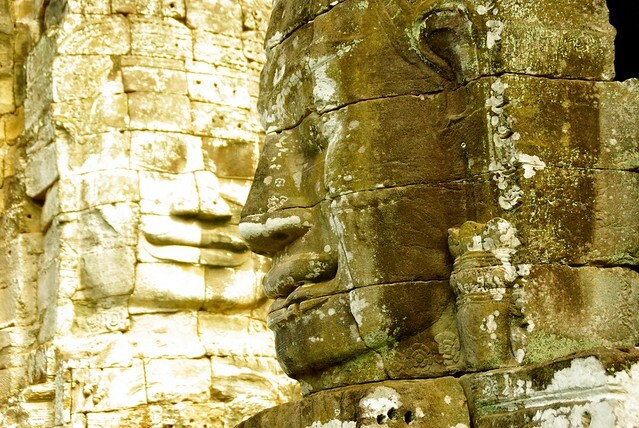 Try to stay closer to Angkor Wat than Siem Reap. We stayed at Lotus Lodge which is about 5km from Siem Reap, and 5km closer to the temples. It’s about 6km to the temples from the lodge. Bring a large enough card for your camera. We took almost 500 pictures in 12 hours. Great pics but must have been hot biking around! We were pleased to be on a tuk tuk during our visit in March as it was scorching. Looks gorgeous. Think we’ll go with the DIY bike rental as well. Thanks for the tips!